The FIDH, on 6 March 2014, issued a statement on the lack of access to medical care for human rights defenders in Iran, resulting in further deterioration of their health FIDH fears this may amount to a systematic practice aiming at further intimidating civil society voices critical of the regime. On 23 August 2013, the Observatory for the Protection of Human Rights Defenders, a joint programme of FIDH and OMCT, expresses its deep concern about the Iranian blogger and human rights activist Hossein Ronaghi-Maleki, whose health status has been deteriorating. On August 9, 2013, Mr. Hossein Ronaghi-Maleki started a hunger strike to protest the authorities’ ongoing refusal to allow him to continue his medical treatment out of Evin prison in Tehran. His mother, Ms. Zolaykha Mousavi, also started a hunger strike on August 20, 2013 to draw attention to his plight. Ronaghi-Maleki has been suffering from kidney and heart problems and bladder inflammation. Since the beginning of his hunger strike, he has suffered kidney bleeding, blood pressure oscillations and arrhythmic heart beats. He has already undergone several operations on his kidneys that were damaged after being repeatedly tortured during his detention, including 13 months in solitary confinement. He has been serving a 15-year prison sentence after being arrested on December 13, 2009 and convicted on charges of “membership of Iran-Proxy Internet Group”, “spreading propaganda against the system”, “insulting the Iranian Supreme Leader and the President”. via Iran : IRAN: Grave concern over health status of human … – FIDH. The LA Times and others report that jailed Iranian human rights lawyer Nasrin Sotoudeh, 2012 nominee of the MEA and winner of the Sacharov Award, has halted her hunger strike after the Iranian judiciary agreed to drop a travel ban against her daughter, her husband Reza Khandan said this Tuesday. Sotoudeh had endured nearly seven weeks without food, drinking salt and sugar solutions, to protest her 12-year-old daughter Mehrave being banned from leaving the country. The couple claimed their daughter was being punished for the alleged crimes of her mother, who has defended dissidents. Khandan went with a group of female activists to the Iranian parliament on Tuesday, where they met with reformist lawmaker Mohammad Reza Tabesh, who in turn negotiated with the deputy speaker and speaker Ali Larijani to obtain an agreement from the head of the judiciary, Khandan said. “They agreed to close the dossier of Mehrave and she is no longer banned from leaving the country and there are no charges against her,” Khandan said Tuesday. The family reunited Tuesday evening in the administration department of Evin Prison, the husband said. Sotoudeh, who had earlier been restricted to talking to her children behind a glass partition, was allowed to hug her son and daughter. “There she stopped her hunger strike and started eating in front of us,” he said. The United Nations high commissioner for human rights called again Tuesday for Sotoudeh to be released along with other detained human rights activists. Iranian authorities often target the families of human rights defenders, “a disturbing trend apparently aimed at curbing the freedoms of expression, opinion and association,” spokesman Rupert Colville said in a Tuesday briefing. Prominent human rights defender Narges Mohammadi was arrested last month. On Wednesday 26 April Reporters Without Borders (RSF) in Paris said the group “strongly condemns” her jailing. Narges Mohammadi was a spokeswoman for Ebadi’s now-banned Center for Human Rights Defenders. She was reportedly detained on Saturday 21 April and brought to Tehran’s Evin prison to begin serving a six-year sentence following a conviction in 2010 after she was accused of anti-government crimes. Mohammadi had remained free pending appeals. Ebadi left Iran after the disputed re-election of President Mahmoud Ahmadinejad in 2009, which touched off unprecedented protests and harsh crackdowns by authorities. Several of her co-workers have been arrested and harassed, such as Nasrin Sotoudeh, recently announced as a 2012 nominee of the Martin Ennals Award for Human Rights Defenders (www.martinennalsaward.org). Today the nominees of the Martin Ennals Award for Human Rights Defenders 2012 are announced in Geneva. The ann0uncement was made by the new Chair of the Martin Ennals Foundation, Mrs Micheline Calmy Rey, until last year the President of and Minister of Foreign Affairs of Switzerland. Each nominee deserves its own post! One of the 3 nominees is Nasrin Sotoudeh from Iran. Nasrin Sotoudeh is a human rights lawyer and a member of the now closed Defenders of Human Rights Centre (DHRC); she was imprisoned for “spreading propaganda against the State”, “collusion and gathering with the aim of acting against national security” and “membership in an illegal organisation”. She worked for Shirin Ebadi‘s law firm, and represented imprisoned opposition activists following the June 2009 presidential elections. In this regard, she represented Shirin Ebadi after she left Iran and her assets were confiscated. On September 4, 2010, Nasrin Sotoudeh was arrested, and later sentenced to 6-year of prison and a 10-year ban on practising as lawyer. She remains detained in Evin prison and on several occasions subjected to solitary confinement. Unlike fur common criminals her family visits and furlongs are limited. 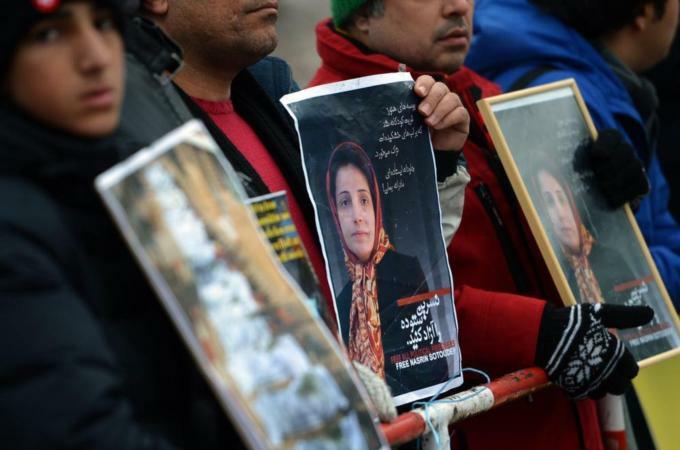 Despite real danger for her security and liberty, Nasrin Sotoudeh has relentlessly defended those most vulnerable. As started by Iranian Nobel Peace Prize winner Shirin Ebadi “Ms. Sotoudeh is one of the last remaining courageous human rights lawyers who has accepted all risks for defending the victims of human rights violations in Iran”. After Akbar Ganji (2006) and Baghi (2009) this is the third human rights defender from Iran chosen by the Jury in the last seven years. The Government will surely portray this as a bias, but the rest of the world will understand that Iran is one of the worst when it comes to respect HRDs.